Kicking Horse Mountain Resort at Golden is labelled as 'The Champagne Powder Capital of Canada' and is known for its steep and deep chutes, 4 alpine bowls, 2,800 acres of light & dry 'champagne' snow and is home to Canada's most elevated dining experience - Eagle's Eye Restaurant - perched at 7,700 feet above sea level. Along with boasting the fourth largest vertical drop in Canada and being a mecca for skiers and snowboarders around the world, Kicking Horse is a multi-seasonal resort. Don't think that the Horse is too wild to wrangle, there is also a Horse Play Corral (beginner area) (expanded for this winter) where never-evers and new riders alike can feel comfortable in the saddle. And, Winter 2019 will allow guests to heli-ski from the exclusive heli-pad at the base of Kicking Horse Mountain Resort! Additionally, a large terrain expansion has just been completed and is open to the public. The revered Ozone face adds over 600 acres of incredible big mountain lines. 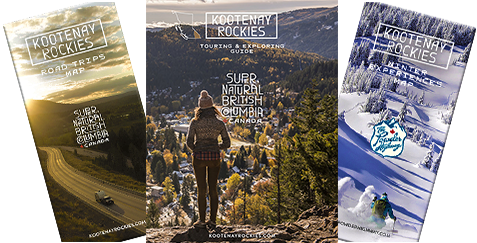 Facilities: Day lodge, cafeteria, rental shop, ski school, daycare, retail shop, guest relations, Eagle's Eye Mountaintop Restaurant, General Store, retail building, Real Estate office. Shuttle Service: Kicking Horse Connector is a free shuttle which connects Golden and Kicking Horse Mountain Resort on Friday and Saturday evenings throughout the winter season. A shuttle service connecting Calgary International Airport to the resort will run twice a week, via the Banff Brewster Airport Express, Wed & Sat, December to March. Accommodation: Accommodation in the town of Golden - 15 minutes. On-mountain accommodation available at the phone number above. The eight person gondola continues to transport visitors to the summit in 12 minutes. At the top of the mountain, you'll look at a 4,133 foot ski-out. Its descent will take you through everything from wide-scooped, alpine bowls to steeps and glades. The alpine bowl, Superbowl is an incredible place for advanced skiers on a powder day, but all chutes tend to get twice as much snow than forecasted! At the heart of the village lies a magnificent stone and timber, two-story day lodge. Here you'll find everything from great food, such as the famous Kicking Horse chili to an extensive list of mountain services. The village also includes three condominium hotels, three boutique lodges, six restaurants, four retail locations as well as a number of ski-in/ski-out town homes and Mountain School and Daycare facilities. The kids learning and lunch area is right in the heart of the base which makes it easy for lunches during ski school lessons and for parents to meet up with their children, being located in the beginner area. The Learning Centre also offers a variety of family activities including tubing, skating and daily kids snowmobile tours with Rocky Mountain Riders. And, near the top, is the Eagle's Eye Restaurant, the highest in Canada. They will be whipping up some sweet mountain nachos this winter which will be well worth your while to sample at the end of a day on the slopes or book a table of dinner service every Friday & Saturday night! Summer 2015 was the grand opening of Western Canada's newest Via Ferrata (secured climbing routes) to add to its long list of adventure summer activities: Gondola accessed sightseeing, Grizzly Bear Interpretive Centre (with resident grizzly, Boo), Ridgeline hiking and world-class mountain biking. Champagne Powder Capital of Canada. Click to watch: KHMR - The Kid Inside video. Click to watch: The Control Route video.